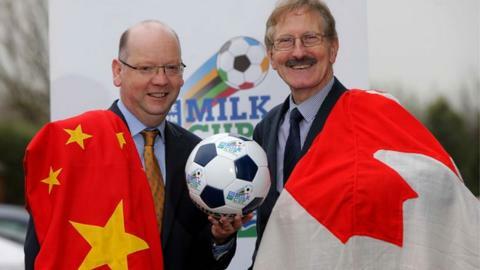 Canada will make their first appearance at the Milk Cup this year while China will also compete in the Elite section. The Chinese have sent clubs sides to the event and current U20 national coach Li Bing had a spell at Liaoning, who have participated in the Milk Cup. Canada coach Robert Gale is looking forward to bringing his team to Northern Ireland. "It's an opportunity to test themselves against other elite players and to showcase individual talent," he said. Gale, who played for Fulham and Wycombe Wanderers, was appointed as Canada coach earlier this month. "It gives our group tournament experience which is huge before going into World Cup qualifying," added Gale. "I think we have a lot of quality throughout our squad so I hope people watching in Northern Ireland and beyond will be pleasantly surprised at the talent level of Canada." Gale is hopeful he can secure the services of Michael Petrasso and Dylan Carreiro, who are both in the Queen's Park Rangers set-up. Petrasso has gained first team experience on loan with Oldham Athletic and Coventry City in recent months. The tournament starts with the traditional parade of competing teams through Coleraine on 27 July and concludes with finals night at Ballymena Showgrounds on 1 August.